HAMLET — Morgan Hooks had a problem. In practice on Thursday, less than 24 hours before the start of her team’s Southeastern Middle School Athletic Conference championship match against rival Rockingham, she broke her big toe on her right foot. Her passing foot. Her shooting foot. Jayana Nicholson, right, notched an assist in the Red Rams’ 4-0 victory over Rockingham on Friday in the conference championship. In soccer, that’s called a bad omen. But Hooks turned it into a positive. Besides, Hooks and the rest of her squad had an awfully interesting incentive for Hamlet to win. Coach Ashleigh Buie said she’d learn a dance — student-athletes’ choice — if the Red Rams could complete their season undefeated. At 4 p.m. Friday, the only thing that was stopping them was a roster of Rockingham players looking for revenge from a mid-April loss at home. The Rockets wouldn’t get it, though, as the Red Rams dominated from start to finish en route to a 4-0 victory. The win caps Hamlet’s perfect 13-0 season and provides a bit of revenge for the home team. Buie said each of the past two years her team has lost to Rockingham (11-2) for the conference championship. It was, she said, nice to turn the tables. But then she had to dance. “I kept telling ’em, ‘this is your year,'” Buie said. Chloe Wiggins recorded an assist on Emily Buie’s goal, Hamlet’s first of the match. The dance? Players chose to teach Buie how to twerk. After the final whistle, Candace Little and Jayla Copeland led Buie to midfield. To say the coach needs a little work is an understatement. “I’m not gonna promise it’s gonna be good,” Buie told her players. The coach, of course, was right. “They know I’m a terrible dancer,” she said. The Red Rams, however, continued to do so at will. Rockingham’s goalie did an impressive job of keeping the ball out of the net. Three times the ball got by her, but she faced a barrage of shots from an energized Red Rams offense. The strategy worked, and seemed to keep the Rockets on their heels while, for the Red Rams, it was full speed ahead. From the start, Hamlet’s offense took control and rarely let a ball past midfield. Rockingham couldn’t manage a shot on goal the first 30 minutes. The problem was the Red Rams’ shots kept finding the Rockets goalie or the wrong side of the net. 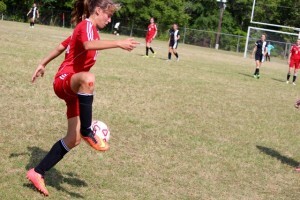 With 3 minutes and 3 seconds left in the first half, Emily Buie broke the scoreless tie. Chloe Wiggins notched the assist. That seemed to open the floodgates for the Red Rams — at least for Hooks. 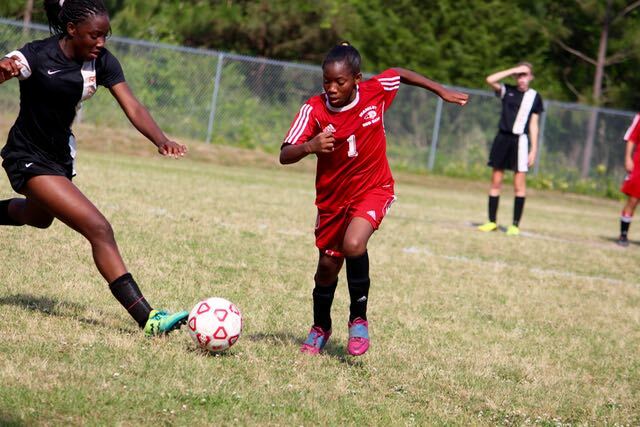 She scored the next three Hamlet goals. Her first was only 3:23 into the second half. The score gave Hamlet a 2-0 lead and, if the mid-April 2-1 win was any indication, it was all they’d need. Hooks didn’t settle, though, and the offense continued to create opportunities for its top scorer. 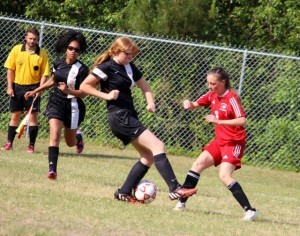 Aerial Spooner, left, and Morgan Hooks battle for possession on the Red Rams side of the field in the closing minutes. Hooks called again with 10:11 left in the match after taking a pass from Jayana Nicholson for a 3-0 lead. Only 3:26 later, Hooks completed the hat trick — and celebrated wildly with Wiggins as the pair returned to midfield. Rockingham coach Amanda Gainey couldn’t do anything but shrug her shoulders and smile. The Rockets, she said, lost to the better team. 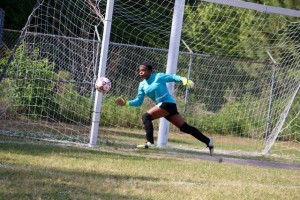 Both she and Buie expressed optimism at the future of Raiders girls soccer once these players reach Richmond Senior High School. Hamlet’s victory snaps the Rockingham girls’ string of two straight conference championships. It also eliminated the possibility of a Rocket sweep of each conference title all year long. Rockingham teams already have claimed conference titles this year in football, volleyball, boys basketball, girls basketball and softball. On Monday, Rockingham and Hamlet match up at 4 p.m., in Rockingham, for the conference baseball title. On Tuesday, the Rockets host the Red Rams in boys soccer with the conference championship on the line. 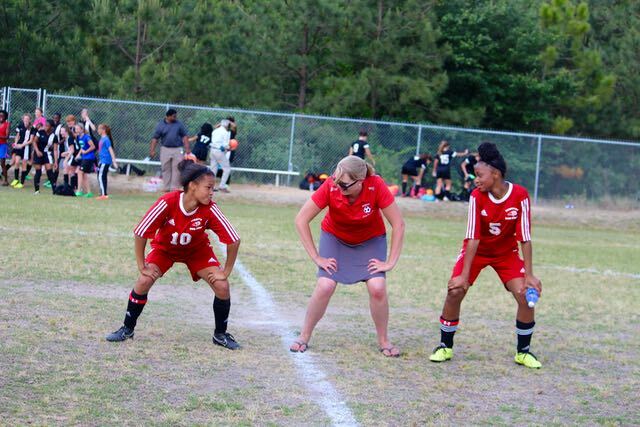 Candace Little, left, and Jayla Copeland, right, help Hamlet coach Ashleigh Buie learn how to twerk.